Are you looking for a unique theme for your new or old WordPress blog? Then getting some designers to go to war with each other maybe the answer. How do you do that? This is where Theme Wars comes in. From a first glance, Theme Wars look like a WordPress theme store, but it’s far more than that. The Weekly War will be a contest to design a particular type of theme (e.g. magazine, business, etc.) as voted on by the community (via poll) the week before. The top two designs which the community votes for will be sold in the Theme Store. The winning designers will receive 25% and 10%, respectively, each time their winning design sells. 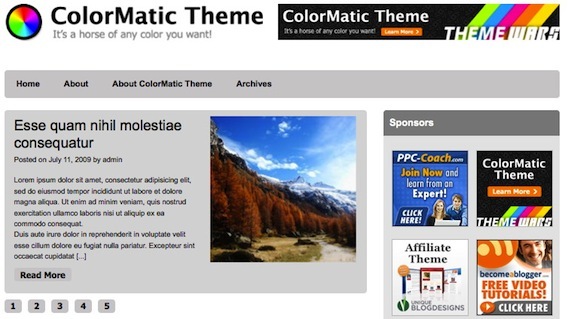 Winning designers are also permanently invited to produce new themes for Theme Wars and share in the profits. For designers, the benefits of Theme Wars is an opportunity to earn money by submitting their designs into the Weekly War. Not only will the winning designers receive a percentage of each sale, they will also earn a spot in the â€œFeatured Designersâ€ page, thereby giving them additional marketing and exposure for their brand. For bloggers, the benefit is access to a wide range of themes from a wide range of different designers. Theme Wars will be truly listening to the feedback of the community via community polls and voting. Bloggers get to vote for the types of designs they would like to see and also the specific theme that the designs will build and sell. All themes are be licensed under the WordPress GPL, which means that even with the basic theme license, bloggers will be able to use the themes on as many sites as they like. Themes are be priced at $69 for a multi-use license to $149 for a developer license (includes Photoshop documents). Theme Wars also offers a monthly membership to get access to all of the themes. This a great package for blogger who wish to try out a variety of themes or for bloggers with multiple blogs and wish to give each one a unique look. An all access standard pass to Theme Wars cost $20 per month plus a one-time payment of $147. This also gives you access to all past, present and future themes, as well as unlimited access to the support forum, documentation, video tutorials and theme updates. An all access developer pass cost $27 per month plus a one-time payment for $177. This also gives you access to all past, present and future themes, as well as unlimited access to the support forum, documentation, video tutorials, theme updates and Photoshop files. I get many emails from readers asking about my “magazine style” theme with its scrolling featured articles on the front page. The usual question is what plugin does that? The answer is none However, Theme Wars feature quite a few themes with the feature articles feature. Check out the Clean Mag Theme and the ColorMatic Theme to see two great examples. Both themes are available for only $69 each for the multi-use license or $149 for the developer license. If you want UBD to create a 100% custom theme like John Chow dot Com, be prepared to spend $3,500 to $7,000. The Theme Wars themes look damn good now, doesn’t it?